Standing at the porch of his house in Ghana, as a young boy, Ashitey Trebi-Ollennu was fascinated by the planes that flew in and out of the airport. But his dreams were not to be a pilot, his imagination was more unique than that. Many years after, the young dreamer has surpassed his imagination. He is now a lead engineer on InSight – NASA’s spacecraft which recently landed on Mars. He is in charge of the mission’s robotic arm mechanism. What does the robotic arm do? The goal of InSight is to understand how planets are formed. But to do so, there is need to look deep beneath the surface. “You have to look at the core of the planet,” says Ollennu, Instrument Deployment Systems Lead on InSight. InSight’s robotic arm will place scientific instruments off the InSight lander onto the surface. “Our responsibility is to pick up the instruments that the scientists are going to use to examine the planets hundreds of millions of miles away,” Ollennu said. The arm, more than 5 feet 9 inches (1.8 meters) long, has a camera attached that will provide 3D color views of the landing site. It is designed to place the seismometer on the surface and position the heat flow probe – a mole that can burrow 16 feet (five meters) into the ground. It will take two to three months for InSight’s robotic arm to set the mission’s instrument on the surface. For now, the robotic arm will be taking pictures of Mars. The engineer majored in Avionics at the Department of Aeronautical Engineering, Queen Mary College, University of London and then obtained a Ph. D. in Control Systems Engineering, at Cranfield University in the United Kingdom. He then moved to the US to do further research in robotics at Carnegie Mellon University in Pittsburgh. “This is my fifth mission landing on mars that we are working on. I’ve been working on Mars for like 20 years now,” he says. 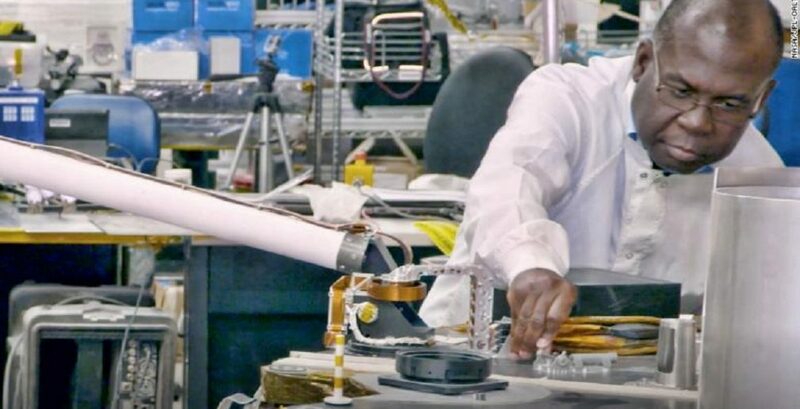 His former projects on Mars includes: the 2003 Mars Exploration Rover, Phoenix Mars Lander of 2007, Mars Science Laboratory in 2011, and the 2016 Insight Mars Lander. Ollennu has obtained numerous awards and recognition for his works. Some of which includes the 2008 NASA Exceptional Engineering Achievement Medal for his contributions to the Mars Exploration Rover mission, and the 2010 Specialist Silver Award from the Royal Aeronautical Society in the UK. “One of the things that people forget is that prehistoric times across the continent of Africa, Europe and Asia our forefathers looked to the heavens and mapped the constellations. And what did they do with them? They created calendars so they can know when to harvest, when to plant …they just looked up into space and then they did all this mapping,” he said. Ollennu says he believes that he is lucky to have had a “solid” academic foundation in Ghana Senior High Technical School, a Science and Technology oriented high school in Takoradi. “There you get to do a lot of woodwork, metalwork, engineering, drawing so that kind of gives you a very good balance and a lot of science as well,” he said. Back home, he is also inspiring generations of young scientists and innovators through the Ghana Robotic Academy Foundation. Founded in 1991, the nonprofit organization encourages school kids to engage in applied science by running hands-on robotics workshops and competitions throughout the country. “We try to apply theory and put it into practice. So we take the theories that the kids are learning in schools. And then we use it to teach them how to program and they can see that science is not just about theory,” he said. The outcome is massive as some of the kids have competed in international robotic competitions like the World Robotics Olympiad and Robofest where they are encouraged to sharpen their skills in Computer, Science, Technology, Engineering, and Maths. Ollennu says he does not believe that any child does not understand maths. “I don’t think anybody is born a natural scientist,” he says. He encourages the kids to put in work to achieve their dreams. Using soccer as an example, the engineer says youths practice soccer for hours in the day to become a star. He enjoins them to invest the same equivalent amount of time to their passions in order to excel. The engineer says his success is down to his parents who he says provided him the right avenue to study. “My mom was a teacher, my dad was an economist, they really encouraged you to study,” he says.